What use the [Shift] + mouse right click it? This button opens a context menu on the pointer, it is access to override automatic object snap snap.Mengaktifkan for many people is not an option. Often it appears automatically snap at a place not expected. In contrast to override the snap. Without shifting the pointer too far from the midpoint, we can download the snap on the end point, for example. 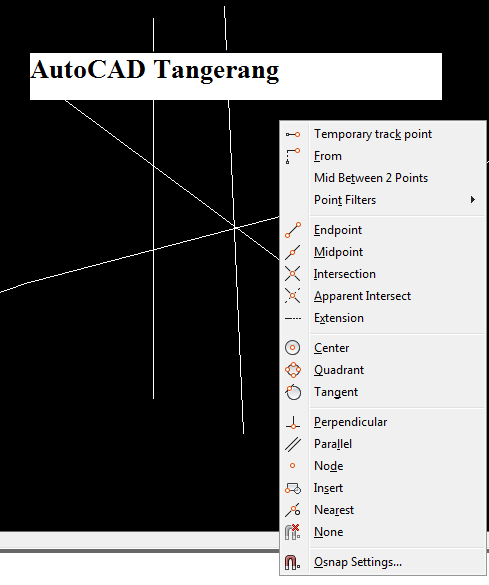 But clicking the snap toolbar also a waste of time, especially for AutoCAD users who are used to using the command line. If you have the same issue, might be like using the context menu. Consider the context menu, each menu has an underlined letter. Letters can be pressed to activate the snap. besides using shift + right-click to snap override in autocad can also use ctrl + right click the same function and their role.